There isn’t many spirits in the world that make our office as happy as scotch does, in fact when we mentioned this as the topic of this weeks post there was visible salivation. So let’s dive straight in so we can open up a bottle and have a dram. Lets quickly get the classifications out of the way – remember we are only looking at scotch today, have no fear though go and take a look at what we have on bourbon. It must also be made in Scotland from grain grown in Scotland. Aged a minimum of 3 years in Scotland and bottled at no lower then 40% abv. The preservation of scotch and the scotch distilleries means that the classification of scotch is notoriously difficult to be mishandled or even misrepresented. There are 68 characteristics to be measured and as things stand there are only 109 classified scotch’s in production. The History of scotch is so huge that it would warrant an entire series of posts (If you woud like to see that then just leave a comment below) so we have narrowed it down to a quick over view. For a better understanding of a complete whisky history we recommend Lew Bryson’s excellent book titled Tasting Whisky, probably the single best book on the subject. According to the Scotch Whisky Association, no one knows exactly when the art of distilling was first practised in Scotland; it is known that the Ancient Celts practised distilling, and that the liquid they produced — known as uisge beatha (“water of life”) — evolved into Scotch Whisky. The first taxes on whisky production were imposed in 1644, causing a rise in illicit whisky distilling in the country. Around 1780, there were about 8 legal distilleries and 400 illegal ones. In 1823, Parliament eased restrictions on licensed distilleries with the “Excise Act”, while at the same time making it harder for the illegal stills to operate, thereby ushering in the modern era of Scotch production. Two events helped the increase of whisky’s popularity: first, a new production process was introduced in 1831 called Coffey or Patent Still; the whisky produced with this process was less intense and smoother. Second, the Phylloxera bug destroyed wine and cognac production in France in 1880. There are five main stages to the production of Single Malt Whisky; Malting, Mashing, Fermentation, Distillation and Aging. Malting is the process by which the barley is steeped in tanks of water for 2-3 days to start germination of the grain. This germination converts the starches in the grain into soluble sugars that are easier to break down by the yeast. This process must be stopped at the correct time so that the grain does not use up too much of the starch for its own purpose. After soaking, the grain is spread out on the floor and constantly turned to help dry it out ready for peat smoking. Modern methods of malting use troughs and hot air to dry the grain, although the traditional method is to do it by hand that takes more time but gives a better, fuller flavour as the peat flavours can attach themselves easier to the barley. The barley is fully dried in a peat smoke kiln. This reduces the water content from around 45% to 4.5%. The area from which the peat is taken affects the flavours greatly and contributes to the individuality of the single malt. The next stage of the production process is called Mashing. This is done when the grains are completely dry. They are ground down into a powder (called ‘grist’) and mixed with warm water (in a ‘Mash-Tun’) where natural enzymes in the grain convert the starch into sugars. The resulting solution is known as ‘wort’. Fermentation occurs when the wort is transferred into a vat (or ‘washback’) and yeast added. The fermentation process takes between 48 and 60 hours and creates a sour beer known as ‘wash’, which is between 7-9% alcohol. 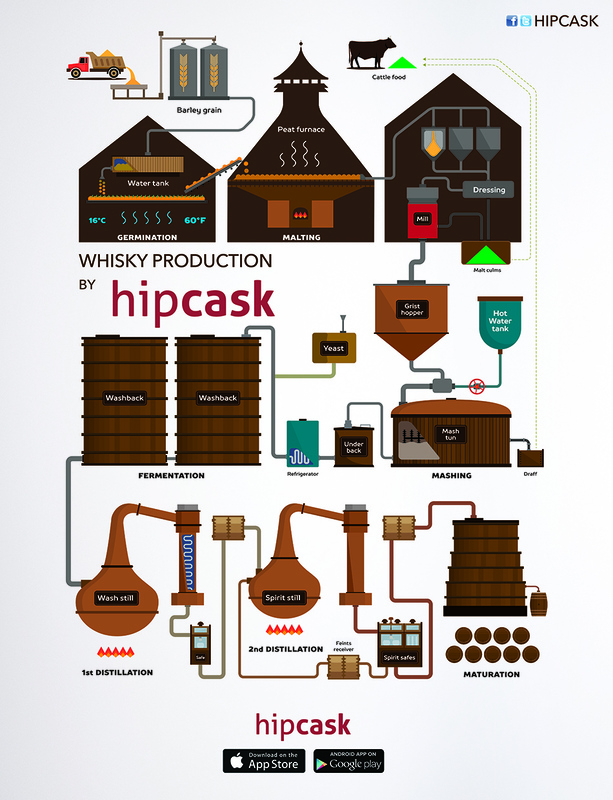 Scotch Whisky is usually double distilled in pot stills; although there are a handful of scotches that triple distill (e.g. Auchentoshan). The first distillation occurs in a larger still called a ‘wash still’. It makes a ‘low wine’ of approximately 20% alcohol. The second distillation occurs in a smaller still and creates a distillate of approximately 70% abv. As with all pot-distilled spirits, the heads (‘foreshots’) and tails (‘faints’) are cut to leave the ‘heart’ of the first and second distillate. The head and tails are added back into the low wines for re-distillation. Peat is an accumulation of partially decayed vegetation matter. Peat forms in wetland bogs, moors and peat swamp forests. Peat is harvested as an important source of fuel in certain parts of the world. This is what give the whisky it’s smokiness. Scotland was traditionally divided into four regions: The Highlands, Lowland, Islay and Campbeltown. Speyside, encompassing the Spey river valley in north-east Scotland, once considered part of the Highlands, has almost half of the total number of distilleries in Scotland within its geographic boundaries; consequently it is officially recognized as a region unto itself. Campbeltown was removed as a region several years ago, yet was recently re-instated as a recognized production region. The Islands is not recognized as a region by the Scotch Whisky Association (SWA) and is considered part of the Highlands region. Lowland – only three distilleries remain in operation: Auchentoshan, Bladnoch, and Glenkinchie. Highland – some Highland distilleries: Aberfeldy, Balblair, Dalmore, Dalwhinnie, Glen Ord, Glenmorangie, Oban and Old Pulteney. The Islands, an unrecognized sub-region includes all of the whisky producing islands (but excludes Islay): Arran, Jura, Mull, Orkney and Skye — with their respective distilleries: Arran, Isle of Jura, Tobermory, Highland Parkand Scapa, and Talisker (Although more closely related to the Islay region). Campbeltown– once home to over 30 distilleries, currently has only three distilleries operating: Glen Scotia, Glengyle and Springbank, the latter two owned and operated by the J.A Mitchell family. Springbank is the oldest independent distillery in Scotland. Islay- The whiskies of the distilleries along the southeastern coast of the island, Laphroaig, Lagavulin, and Ardbeg, have the strong peaty character which is considered to be characteristic of the Islay malts, Many describe this as a “medicinal” flavour. They also possess notes of iodine, seaweed and salt. Highland- The character of the far North Highland malts are greatly influenced by the local soil and the coastal location of the distilleries. They tend to be light bodied whiskies with a spicy character and a dryish finish, sometimes with a trace of saltiness.Malt whiskies from the Central, Southern and Eastern Highlands are quite a mixed bunch. They are generally fruity and sweet but not as sweet as the malts found in Speyside. They are lighter bodied and sweet and just like other Highland malts they tend to have a dry finish. Lowland- Lowland region whiskies are mellower than whiskies from the neighbouring Highlands, and are very much appreciated by those new to malt Whisky and experienced malt drinkers alike. 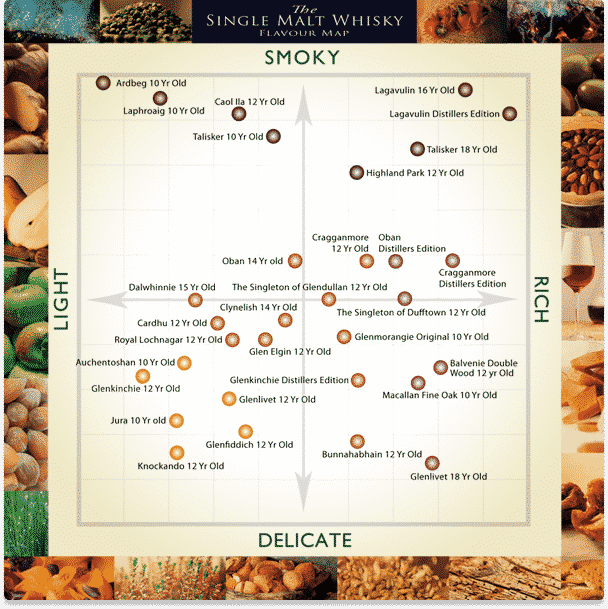 Speyside- The huge selection of Speyside malts offer a variety of strengths and can generally be broken down into two categories, the heavy, rich sherry flavoured malts and the more complex light floral flavoured malts. Speyside malts are essentially sweet whiskies, although some can have a little peaty character with just a slight whiff of smoke. Campbell Town- The Campbeltown single malts are very distinctive, tending to be full bodied, renowned for their depth of flavour and also for their slightly salty finish. With peat adding a hint of flavour similar to that found in an Islay malt. Islands- Due to the location of the Islands distilleries their whiskies tend to have a coastal feel to them. They are slightly more peaty in character than most highland malts but not to the extent of peatiness that you will find in Islay malts. The peatiness is generally softer and sweeter than there stronger cousins from Islay. Blended Scotch whisky constitutes over 90% of the whisky produced in Scotland. 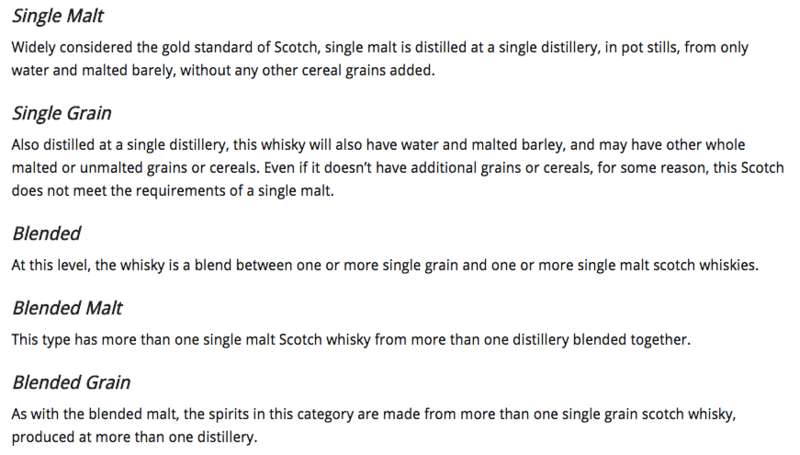 Blended Scotch whiskies contain both malt whisky and grain whisky. They were initially created as an alternative to single malt whiskies which were considered by some to be too harsh. Master blenders combine the various malts and grain whiskies to produce a consistent “brand style”. Notable blended Scotch whisky brands include Bells, Dewar’s, Johnnie Walker, Whyte and Mackay, Cutty Sark, J&B, The Famous Grouse and Chivas Regal. One advantage to a blended whisky it that it will always taste the same every year. Whereas single malts can slightly alter depending on whether conditions and the quality of barrel etc .Blends should always be the same, as the Master Blender can change the recipe of the blend. For example a blender may put a different amount of one whisky in the blend to keep the taste consistent to the taste of the previous years blend. The popularity of Scotch as also been mirrored in the popularity of Scotch cocktails. There is a whole world of possibilities out there for you and other bartenders. Go grab a bottle, take a look at the label. Where is it made? What does it taste like? Why does it taste like that? Make a cocktail with it, how does the Scotch flavours change the taste of the cocktail? Have fun. Scotch is a beautiful thing. Hello to every one, it’s truly a good for me to pay a visit this web page, it includes priceless Information.